Nelly Gabriel said she does not know what it means to not be determined to accomplish something. Perhaps that’s why she came to Florence in 1997 and founded a trucking company in a male-dominated industry. “I was determined to make it work,” Gabriel said. “Nobody knew me, but I thought it was a good place to start a business. I loved the area and fell in love with Florence. 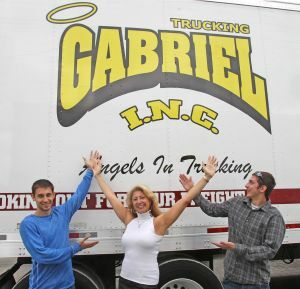 Since opening Gabriel Trucking, she has watched it grow to 11 trucks and 15 employees. She has also helped her two sons start trucking businesses. Nationally, the number of women-owned businesses has increased 68 percent since 1997, according to the fourth annual American Express OPEN State of the Women-Owned Businesses Report. Alabama is ranked eighth in the growth of the number of firms over the past 17 years. That’s an increase of 76 percent during that time. Weeks also said more women are getting involved in businesses not traditionally owned by women, such as Gabriel’s trucking company. Alabama has an estimated 122,400 women-owned firms, employing 101,800 people and contributing roughly $16.7 billion to the economy, according to the report. Wanda Myrick started her business in a non-traditional field in 1976 in Russellville. Myrick owns Abstract and Appraisal Services, which she said is the only full abstract company in Franklin County. “At that time (1976), people trusted a man more than they did a woman,” Myrick said. “It took years to earn respect for things that people did not think I knew what I was doing. Myrick said a woman should carefully consider everything before starting a business. Myrick said one benefit is the ability to take off when needed, like when you need to take your child to the doctor. “But when the economy is rough, you really have to tighten your belt,” Myrick said. Weeks said minority-owned firms are growing at a much faster rate. Today, one in three new women-owned businesses are held by minorities, according to Weeks. That number was one in six 17 years ago. Weeks said women looking to open a business should follow their passion. Leslie Keys started a women’s clothing shop, Audie Mescal, 12 years ago in Tuscumbia. She recently opened a men’s clothing store, Leo Martin. Keys said she has enjoyed success. Keys said a number of women-owned businesses are in the Main Street area of Tuscumbia. Weeks said women’s business centers and other resources are available. Gabriel points back to determination as being a key to success. Wayne Smith can be reached at 256-740-5746 or wayne.smith@TimesDaily.com. Follow on Twitter @TD_WayneSmith.